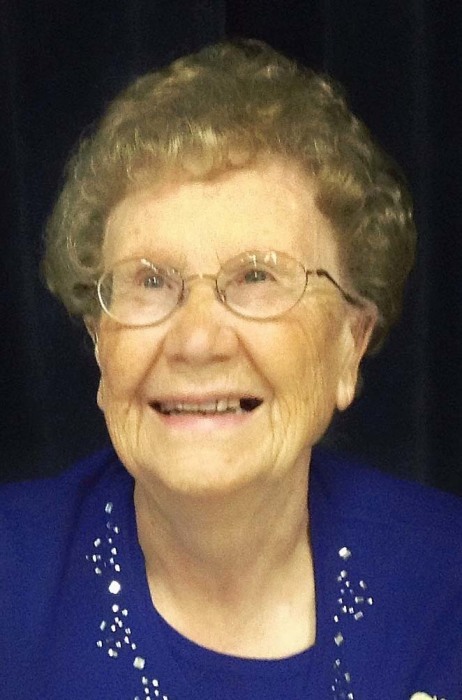 Obituary for Louise Smith | Prairie Sunset Funeral Home, Ltd. It is with sad hearts that we announce the passing of Louise Smith on Sunday, February 10, 2019 at the age of 93. We are thankful for her long life and the end of her short illness and suffering. Louise leaves behind her daughter, Noreen (Blaine); her two sons, Rob (Carolyn), Darryl; six grandchildren: Erin (Ken), Melissa (Mark), Chelsey (Kyle), Steven, Shantel, and Kailan; four great grandchildren: Anthony, Charlie, Oliver and Camryn; six nieces and two nephews who loved her dearly and many friends. She was predeceased by her husband, Percy (2004); grandson, baby Daniel (1980); parents, Jessie & Andy; one sister, June (Chuck); one brother, Larry (Irene); one brother in law, Les (Jean). She was born on October 15, 1925 at her home in Linaria, AB. She lived there until her move to Westlock in 2008. Louise was an active member of her church and community and loved to be with people and spent many hours serving food, drink and love. She will be lovingly remembered for her contagious smile and hearty laugh. A Memorial Service will be held on Saturday, February 16, 2019 at 11:00 a.m. in the Hazel Bluff Community Hall, Hazel Bluff, AB with Pastor William Harder officiating. Anyone who so wishes may make a memorial donation directly to Stollery Children’s Hospital Foundation 800 College Plaza, 8215 – 112 Street, Edmonton, Alberta T6G 2C8 or a local charity of one's choice.